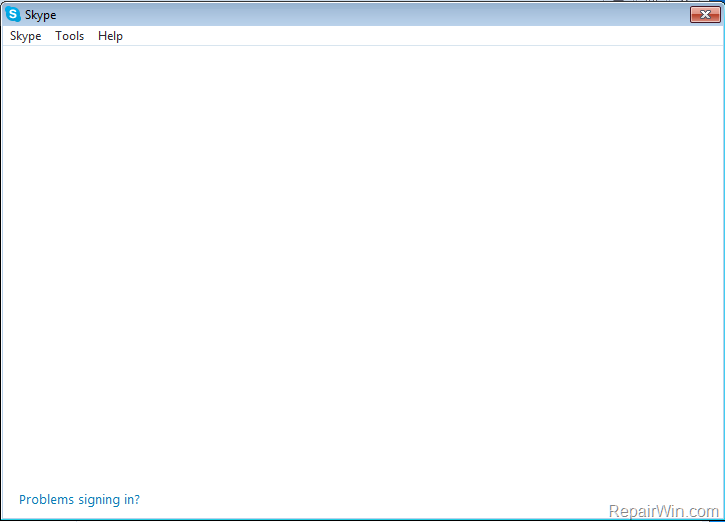 This tutorial contains instructions to fix the Skype blank/white screen issue, after entering Skype credentials. In fact, Skype displays only the menu bar and an empty window, without any information or an error message to understand what cause the problem. This tutorial contains several methods to resolve the "Skype empty screen" issue, after press the Sign-In button to login to Skype. How to fix Blank Screen issue in Skype. Method 1. Scan your computer for Malware. First, check your computer for malware infection by using this Malware Removal Guide. Then try to connect to Skype again. Method 2. Delete Skype Login information. 1. Press the Windows + R keys to open the run command box. 2. In the Search box, type: “%appdata% & click OK.
3. Delete the Skype folder. 4. Download Skype LoginCleanup on your desktop. 6. Run 'LoginCleanup' as administrator. * By resetting Internet Explorer, you restore your browser to the state where it was when first installed on the PC. Try to connect to Skype again. Method 4. Add the /legacylogin switch to Skype shortcut. 1. Right click on Skype icon (at the taskbar) and select Quit Skype. 2. Delete the Skype icon from your Desktop. 5. Right click on the Skype shortcut (on your desktop) and select Properties. ** Don't forget to replace the "Skype_Login_Name" and the "Skype_Password" fields, with your own Skype credentials. Method 5. Uninstall and re-Install Internet Explorer. 1. Navigate to Windows Control Panel and open Programs and Features ("Add or Remove Programs" on Windows XP). 2. From the left pane select View installed updates. 3. Select the 'Internet Explorer' and click Uninstall. 4. Wait until the removal/uninstall process is completed and then restart your computer. 5. After computer restart, download and install the latest Internet Explorer version for your system. 6. After IE installation restart you computer and try to connect to Skype again. Method 6. Complete Uninstall and re-Install Skype Application. If you still face problems then follow the steps below to completely remove the Skype application from your PC and to re-install Skype. 2. Uninstall Skype using Programs and Features (or "Add or Remove Programs" if you 're using Windows XP). 3. Then download and run the Skype Removal Tool (SRT.exe) to remove all Skype traces. 4. After uninstall, press the Windows + R keys to open the run command box. 5. In the Search box, type: “%appdata% & click OK.
6. Delete the Skype folder. 1. If you have problems, while installing Skype, by using the latest Skype installer package, then install Skype by using the Skype Full Installer package. 2. If you own a Windows XP or a Vista based computer and you have problems with the latest Skype version, then try to install a previous version of Skype from here. Method 7. Sign-In to your Skype Account from Internet Explorer. 2. Open Internet Explorer and Sign-in to your Skype Account. 3. After Sign-in, double-click at your Skype shortcut (on your desktop) to launch Skype, or use the Skype for Web plugin for your Skype calls. « FIX: PC Loses Time Settings – 4 Ways to resolve the problem. » FIX: Windows 10 Not Shutdown Completely.